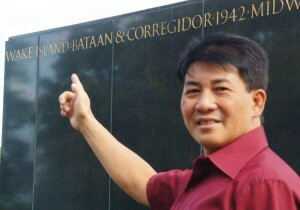 Filipinio Legislator Herbert Borja points to “Bataan” on the base of the Iwo Jima Memorial, Arlington National Cemetary next to Washington, DC on a previous visit to United States. The 13th annual Freedom Leadership Conference on December 5, 2012 at the Marriott Courtyard Hotel in Tysons Corner, Virginia will feature keynote remarks by a legislator from the Republic of the Philippines who is very concerned about Communist China’s recent aggressive moves in the Pacific and the appearance of U.S. retreat against a common problem both his country and the United States face. Hon. Herbert Serrano Borja of the Republic of the Philippines will raise the alarming question, “Will the new ‘California Maginot Line” be America’s next Pearl Harbor? He will point to the false sense of security engendered by the massive fortifications built by the French to deter a German attack – and which were easily bypassed by German Panzer divisions and the Luftwaffe which rapidly conquered all of mainland Europe in World War II. 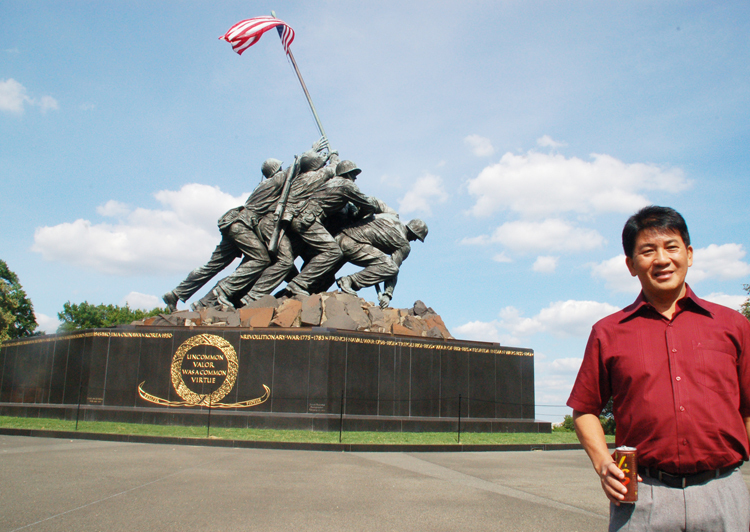 Legislator Borja visited one of the most iconic statues in the world, showing American marines raising the flag at Iwo Jima during one of the bloodiest battles of the war. He reminds Americans and Filipinos alike of the shared heritage forged in blood as the US and the Philippines stood together against Japan in that war, and hopes the two countries can stand together once again to deter aggression by a new common threat, Communist China. The weakness of the western powers and their failure to stand up to the Axis powers of Japan, Italy and Germany not only failed to deter war but are the major reason the world was plunged into war. Is America facing the same problem today with Communist China? Legislator Borja, serving his second term as a Board Member for Albay Province (the equivalent of a U.S. State), is an outspoken supporter of the boycott in his province of goods made in Communist China because he is upset by the increasing threats to his country posed by the growing Chinese Communist navy in the Pacific ocean in his country’s territorial waters. The Chinese navy has taken an increasingly aggressive stance towards other nation’s that contest their claims on disputed territory in the Pacific. The provincial governor led the boycott Chinese goods campaign, which is one way open to citizens in a free country to pressure China to back off their aggressive moves. Legislator Borja’s keynote remarks at the Freedom Leadership Conference are hosted by the United States Intelligence Council, which for 25 years has focused attention on the Communist China threat to U.S. national security interests. USIC has previously published two books by Dr. Roger Canfield: China Doll: Clinton-Gore and the Selling of the Presidency, and Stealth Invasion: Red Chinese Operations in North America (combined circulation of 1 million books). USIC is the original primary sponsor and founder of the Freedom Leadership Conference in 1999 (when it was on the west coast as the Western Conservative Conference) and will host this year’s 13th annual conference. The United States and the Philippines fought Japan together during World War II, eventually freeing the Philippines from the Japanese. “We certainly look forward to hearing one Filipino’s perspective on the Communist China threat to both our countries and sharing ideas on what we can do about it,” said Buck. Legislator Borja at the Korean War Memorial, pointing to the inscription there, “Philippines” as a reminder that embattled American soldiers during that conflict received reinforcements from his country. The remarks by Legislator Borja will be videotaped and available on the Freedom Leadership Conference and U.S. Intelligence Council website together with the text. The Conference will also feature a closed door briefing and discussion with Borja, who says he is coming to America more to listen and learn and gain new insights about common issues facing America, and how friends in both countries aware of the strong historical ties between the Philippines and the United States, can work together to improve their security and expand freedom, then to merely speak his own opinions. He will report back in the Philippines new ideas and suggestions from what he learns during his week long visit to America, which will include another round of visits to monuments, a seminar and meetings with key American leaders such as the leadership of the Freedom Leadership Conference on December 5. In his 2nd term of office, Legislator Borja serves as Chairman of two Committees for the Albay Province 3rd District (there are three districts total for the Province), 2010 to present: Health and Social Services and Millennium Development. In the previous term (2007-2010) he served as Chairman of two Committees: Health and Sanitation, and Labor and Cooperative. Legislator Borja holds a BS degree from Far Eastern University, Philippines and has worked in private industry for most of his life. Just before his election to public office he had served as the President and General Manager of a pharmaceutical and healthcare firm. He is a former President of the town Kiwanis Club (Polangui) and of the metropolitan regional Rotary Club. During his years in private industry he won various awards in recognition of his performance including “Highest Growth Award,” Professional Service Representative of the Year,” “District Manager of the Year,” and “Best Performer in Asia-Pacific Region” (one of the four best in the world). 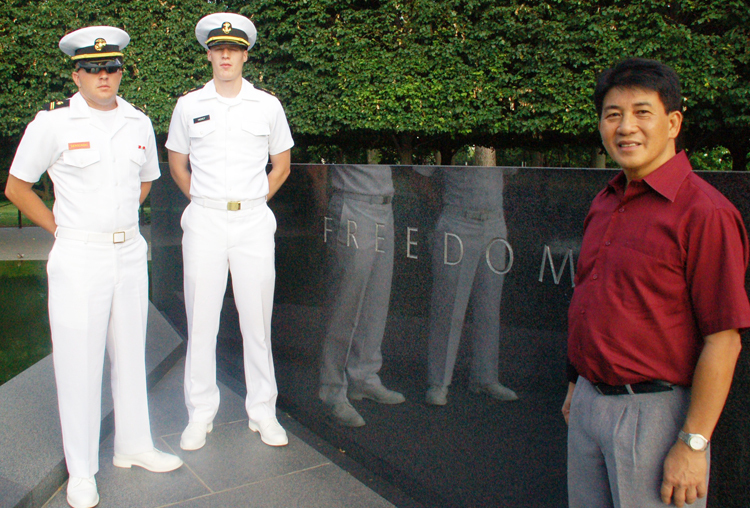 “Freedom is not free” reads this inscription at the Korean War Memorial, as Filipino Legislator Herbert Borja thanks two American sailors for their service. Legislator Borja, as the keynote speaker at the 13th annual Freedom Leadership Conference (“invitation only” for members) at the Marriott Courtyard Hotel in Tysons Corner (McLean), Virginia on Wednesday, December 5, speaks just two days before the anniversary of the first strike surprise attack by the Japanese at Pearl Harbor. 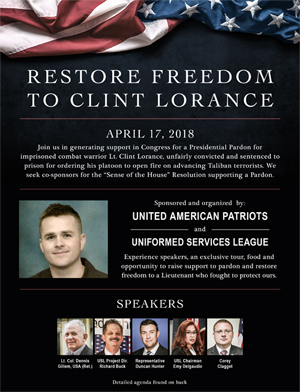 He will also be the guest of honor at a private dinner just before the conference at the Marriott with the Leadership Council of the Freedom Leadership Conference. If you would like information on how you can become a member of the Freedom Leadership Conference and become eligible for information emails including details on how you may attend this conference on December 5 and notices of monthly meetings starting in January, write: RSVP@FreedomLeadershipConference.org and be sure to provide background/biographical information and how you learned about this Conference. Attendance at the conference is by invitation only with advance confirmation required (ie. Members only). This entry was posted in Announcements and tagged China Doll: Clinton-Gore and the Selling of the Presidency, conservative, Dr. Roger Canfield, Filipino Legislator, Free China, freedom, Freedom Leadership Conference, Hon. Herbert Serrano Borja, Leslator Borja, new California Maginot Line, Red Chinese Seapower, Republic of the Philippines, Richard Buck, Stealth Invasion: Red Chinese Operations in North America, Taiwan, United States Intelligence Council, USIC, Western Conservative Conference. Bookmark the permalink.